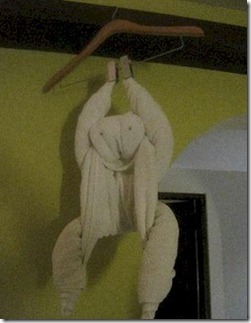 I was inspired by the terry cloth creature above to take the plunge into the latest social media – Pinterest. Pinterest allows you to set up albums to share collections of photos. I’ve already featured room art a number of times including ‘Bed Decoration’ and ‘Bed Art’, but this particular piece (shared with permission from guest Vincent Benita) is by far the most elaborate and cheeky I have ever seen. I was tempted to create a ‘Maldives Sunset’ Board since there are so many prize examples of those on the web, but I’m going to start with these first.